When the late night munchies strike, avoid these foods to ensure a peaceful sleep and avoid the next day sluggishness and weight-gain. Sugar-y Foods: Sweets spike your blood sugar which may disrupt your sleep cycle, and since you won’t be very active after eating them, excess sugar will stored as fat. Hello, weight gain. Fatty / Greasy Foods: Late night munchies often lead to a slice of pizza or a quick drive-thru run, and while neither are healthy to begin with, they’re doubly worse at night. They are hard to digest and you may feel sick lying in bed, like there’s a brick in your stomach, and wake up feeling sluggish. Meat: Meat is heavy and hard to digest, which isn’t ideal right before bed when you’ll be laying down for 8 hours. You’ll likely wake up feeling puffy, bloated, heavy, and sluggish. Dark Chocolate: While dark chocolate is typically a decent snack choice, you want to avoid it late at night, as the caffeine acts as a stimulant and may end up keeping you up and wired for hours. Fresh Vegetable Sticks: A few veggie sticks, such as carrots, celery, or cucumber, can be an easy to digest late night snack. It’s better to eat them on their own, but if you want to use a dip, choose one without a lot of sodium, as too much salt can leave you bloated and dehydrated. A homemade hummus can work well. Fresh Fruit: A few cubes of cantaloupe or a small piece of fruit can satisfy a sweet craving without doing damage. Organic Popcorn: A handful or two of organic popcorn is relatively light compared to most other snacks, and should sit well even if you have it just before bed. Just avoid the heavy butter and salt. Warm Veggie Salad: If you haven’t eaten dinner and are really hungry, opt for a small serving of a warm veggie based salad, like this Mediterranean Quinoa Salad. 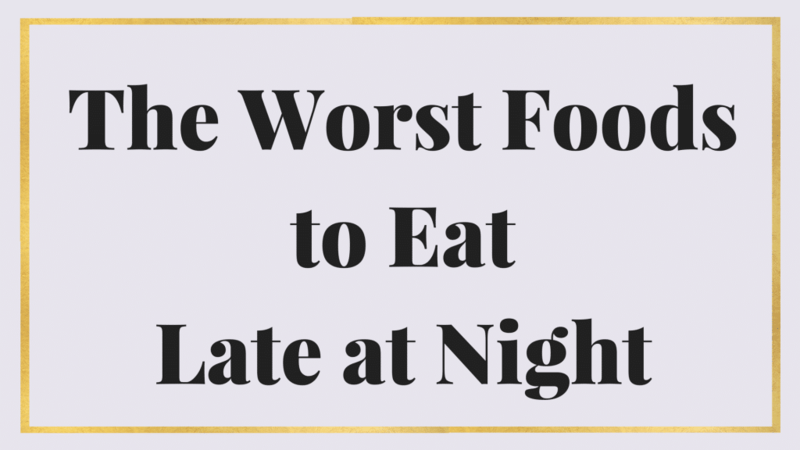 It will satisfy you, but will be easier to digest than most other late night options. Try to stay up for at least another hour or two before hitting the sack, to give your body much needed time to digest. My favorite “go to” snack is a handful of Skinny Pop popcorn, just enough sea salt and crunch !